JWT Intelligence's worldwide director notes the latest in fitness and fashion in Austin. It's a curious thing with events like SXSW Interactive: The ambient, unconscious trends can be just as telling as the ones being touted and discussed in panels. I always look at what participants are wearing, what apps they're using, what they're eating and drinking. (Well, perhaps not the fashion at CES, which is uniformly slacks and plaid shirts). This is a big group of influencers and leaders, after all. One thing that sticks out this year is fitness and wellbeing. The hedonism, the tacos, the food trucks and partying are still here in force, for sure, but they're now countered by droves of LuluLemon-clad joggers pounding the sidewalks of San Jacinto Boulevard to sweat out their excesses at 7am the next day. Premium sports brands are out in force to cater to this: Soul Cycle, CrossFit, Equinox — they all have presences here on the lineup and are staging classes or pop ups. 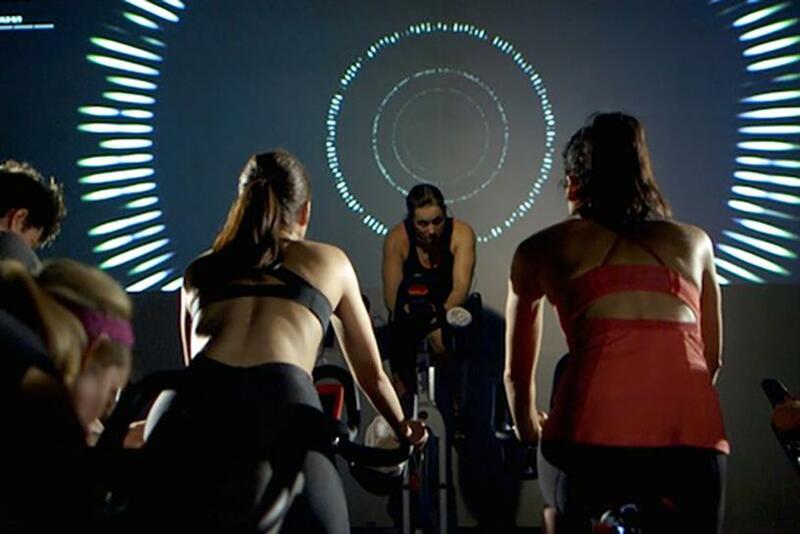 Equinox is set up next to the Fast Company Grill, inviting visitors to take part in its new immersive competitive spin class The Pursuit, in which data from each bike is collated in real time with leader boards on display. The class has just been introduced. In the official version, cyclists are surrounded by creatively visualized data on screens generated by their movement. This is an interesting addition for Equinox. We are seeing more digitally immersive exercise classes. Reebok just introduced a whole series of immersive fitness classes with Les Mills that are offered in enclosed boxes lined in digital interactive screens. At CES, artist Lia Chavez also created a meditation nightclub for The Cosmopolitan hotel which translated meditative brainwaves into a visual digital experience. Back to sport, though. Equinox was also on the lineup. Equinox president Sarah Rob O'Hagan hosted a talk — "How the Data Era Will Build High Performing Humans" — featuring speakers Haile Owusu, chief data scientist at Mashable; Victor Cruz, wide receiver for the New York Giants; and Michael Gervais, PhD in high performance psychology. The talk centered on the quantified self and using data to augment human performance in sport — from athletics to members of Equinox connecting their Jawbones or Fitbits to their branded app — tracking heart rate, success, time and sleep. Beyond the gym freaks, another key theme on Saturday was sustainability — again (as it should be). Alongside talking about his new emotional visual sharing app "Super," which he claims will redefine social connectivity, Biz Stone spoke of the importance of CSR. "The future of marketing is philanthropy. Young people in particular are attracted to companies with meaning," he said, adding that increasingly companies will need to do more CSR and philanthropy to retain Millennials as employees. Patagonia chief executive Rose Marcario also led a passionate discussion about innovation in sustainability. Patagonia has had massive success in this space, innovating in sustainable fabrics, creating recycled clothing collections and even donating solar panels to people in Hawaii as part of its efforts. In the process, it is getting a slew of organic press attention. Patagonia has a team called "creative idealists" who create products that outperform while being responsible to the planet. Marcario also echoed Naomi Klein's recent argument that publicly traded companies are damaging the environment because the necessity for short-term profitability does not allow brands to think long-term, strategically or "bigger picture" in investing in sustainability. Daniel Bobroff, head of investment at Asos, touched on this same issue on the same day in a talk dubbed "Building a Lean Mean Fashion Business Machine." Companies are not thinking about their long-term life or building strategies for the distant future (which, by the way, is not that distant any more) and sustainability is central to that. Bobroff said that the average life span of a company now is 15 years whereas previously it would have been 50. Returning briefly to Stone's "Super" app — the jury's out on its ambitious vision to redefine social networking but the app — which invites users to share images based on their emotions — sits neatly with the Gen Z cohort who as we all know loves everything emoji, Tumblr and visual in their networking. The look, which feels like a poppy digital fanzine, is inspired by artist Barbara Kruger. Day 3 and the sneakers are on for another — somewhat weary — 7 am workout. SXSW: what can we learn from scientific concept?